With an array of devices – both mobile and otherwise – now used to access the web, it comes as no surprise that more and more websites have moved to adopt web designs that can accommodate as many users as possible. Perhaps the most helpful form of new web design available pertains to responsive web design, which determines which devices are being used to access your website and then displays a version relevant to their screen’s resolution and capabilities. You have no doubt browsed plenty of websites from a mobile device at one point or another – some may provide a mobile-friendly version, while others can be hard to navigate. If you want to take advantage of the explosive growth in mobile traffic and optimize SEO at the same time, then a responsive web design is crucial. Below, we’ll discuss why this is important and what you can expect from your efforts. 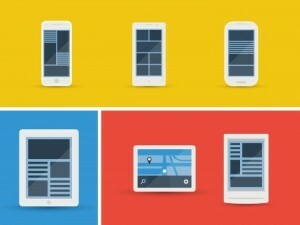 Responsive web designs are increasingly becoming featured in both desktop and mobile versions of search results. Google wants to be pinging URLs to its users that are relevant and user-friendly; since responsive web design allows the site to be displayed in whichever way is optimal, more and more weight seems to be applied to these entities. While some continue to debate whether a responsive web design is a better solution than a mobile-exclusive version of a website, the ease of use and the reported SEO benefits offered by responsive web design is hard to deny. Some quick modifications of your site’s CSS and themes can activate this feature and help you better reach people via mobile searches. Your bounce rate can be a huge role in how search engines view and rank your website. If users constantly leave your website after just a few seconds, Google and others detect this behavior and will adjust their rankings accordingly. A responsive web design helps minimize bounce rates due to the fact that you will no longer lose visitors and customers from having an improper format. Highly complex websites that cater only to desktop users may find themselves experiencing high bounce rates among mobile users, which can further damage their credibility in mobile search, leading to even less traffic. A responsive web design will help you avoid this fate and improve overall SEO effectiveness. Users like to share and recommend content and services to other friends, family members and acquaintances. Unfortunately, a website that does not use responsive web design may make bad impressions upon a significant segment of your traffic. This results in lost opportunities for sharing content and pinging URLs time and time again. While these incidents may not result in experiences where users will be inclined to speak negatively about your website to others, it does kill the potential for viral possibilities among a large share of your visitors. Responsive web design also allows you to embed sharing options in various areas, depending on the type of device of the user. Because of this, you can feature social sharing options where they are most likely to be used by people on desktop and mobile devices alike.